Over the past couple of years, I’ve mentioned some of my personal favorite “undiscovered” photographers (part 1 and part 2). I say “undiscovered” because these folks are not your mainstream hotshots known by every other photographer on the face of the Earth — but, you never know what the future holds (plus they’re still freakin’ awesome)! So this time around, I’d like to give all of you the opportunity to highlight an “undiscovered” photographer. Simply leave a link in the comments to the website or portfolio of your favorite non-mainstream artist (please don’t link to just an image file). Limit your choice to ONE photographer — somebody who does outstanding work. Oh, and try to refrain from promoting yourself… this article is about promoting other people (but don’t worry, you’ll get credit for pointing them out!). When the comments die down (maybe a week or two), I’d like to get in touch with some of these photographers and exhibit their work here on the blog. I can’t say that I’ll show the work from every photographer mentioned, the exact numbers will depend on the number of entries and the quality of their work. So dig deep and find that “diamond in the rough”! This entry was posted in Reader Poll and tagged art, artist, photographer, photography, poll, question on July 27, 2009 by Brian Auer. More great stuff from the Epic Edits Flickr Pool! This selection of photos is from those entered in the pool between 7/5 and 7/19. This entry was posted in PhotoDump and tagged art, art and photography, digital photography, favorites, Flickr, flickr group, foto, images, photo, photo pool, PhotoDump, photography, photography group, photos, slideshow on July 19, 2009 by Brian Auer. 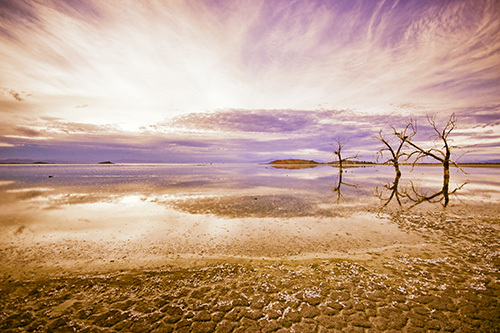 This photo was taken over at Salton Sea on the way to the Sonny Bono Wildlife Refuge at the south end of the lake. The three dead oak trees in the photo are somewhat of an icon for the area, and I’ve seen many photos of them before. I just so happened to arrive at this location a few minutes prior to sunset and the clouds on display were quite amazing. Shooting with my wide angle lens gave me the opportunity to catch the great textures in the ground along with the clouds in the sky. I took several shots from this location and perspective, but I liked this one the best. I think that the strong symmetry right at center frame works well for this photo, and the difference in scenery between top and bottom frame helps to break things up. Looking back now, I probably would have shot at f/8 rather than f/5.6 to get a little better DOF and sharpness. And a graduated ND filter would have produced a much more balanced exposure, resulting in higher quality shadows and highlights. But… too late now! Maybe next time. This image did fairly well on Flickr recently, probably because of the extreme colors presented. 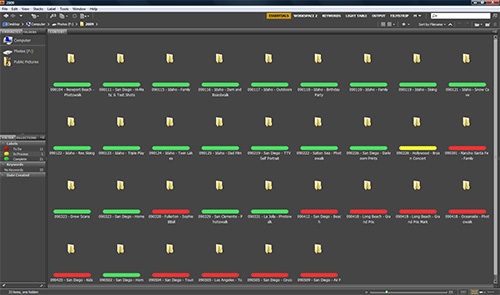 Above, you can see my workflow from start to finish. And below, you can read how I processed the image using Adobe Camera Raw (all of which can also be done with Lightroom). The reason for the crazy colors is because I was trying to reproduce a cross processed effect similar to that of Velvia 100 slide film. I don’t know that I made my goal, but I’m not too disappointed with the results of this one. A bit underexposed in the foreground, but I wanted to keep the highlights from completely blowing out. This is where a graduated ND filter would have helped out. Temperature = 6750; Tint = 0; Exposure = +.35; Recovery = 18; Fill Light = 48; Blacks = 12; Brightness = +65; Contrast = +80; Clarity = 0; Vibrance = 0; Saturation = 0; I warmed the photo up a little bit while also pulling out some of the shadows and pushing down the highlights. Basically, I tried to get the foreground in good shape without worrying about the sky (which is where this next step comes in). Since the sky was totally blown out from the previous settings, I needed to get things back to normal. I used a horizontal graduated filter with a -1 exposure just above the horizon. I also used a vertical graduated filter with a -.5 exposure to take the left side down a bit more. These filters allowed me to keep the foreground where I set it while pulling the sky back to a usable state. Highlights = -32; Lights = +40; Darks = -8; Shadows = 0; This was just a quick adjustment to the tones in order to get a bit more contrast out of the image while holding back those bright highlights. Highlight Saturation = 0; Shadow Hue = 30; Shadow Saturation = 80; Balance = -59; This is where most of the crazy colors come from. I pushed all of the shadows and midtones into a very red hue, which is what usually happens with the Velvia 100 when cross processed. HUE: Orange = +100; Yellow = +25; Green = -70; Blue = +30; SATURATION: Red = +100; Orange = -100; Blue = +50; Purple = +50; LUMINANCE: Orange = +15; Green = +40; Aqua = +20; EVERYTHING ELSE = 0; In this step, I toyed around with the colors a bit more to give me something other than pure red tones. Mostly, I wanted to get the portions of the sky to turn purple since that’s an effect I’ve seen with the xpro’d Velvia film. I also tamed down some of the orange and red in the water areas. So there you go! 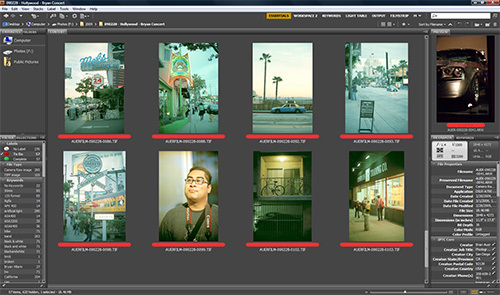 If you have ACR or Lightroom, try out some of these settings and see what you can come up with. It’s always fun to experiment with these things. In addition to the settings above, I applied sharpening and noise reduction as needed. This entry was posted in PhotoBlog and tagged art, cross process, foto, photo, photography, photos, salton sea, sunset, xpro on July 17, 2009 by Brian Auer. I think we’re finally winding down on this series of articles — maybe just one more to pull it all together at the end. 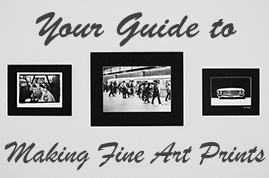 This article will dive into some of the discussion about packaging and shipping your fine art prints. With each step in the process of print making, the piece becomes a little more complete. At the end, you might have to send it to a new owner, and all that hard work is out of your hands during the transit. So I’d like to discuss the various methods for packaging prints depending on their final state: print only, large prints, small prints, mounted prints, and framed prints. On all of these points, I’d like to hear from those who have packaged and shipped prints of their own. There are a lot of little ins-and-outs when it comes to this topic, so I’m sure we could all learn something from each other. 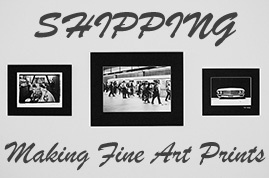 Packaging and shipping prints without the mount, mat, or frame is generally the most cost effective. If you go this route (also assuming that the recipient is ok with the idea) there are a few options for packaging the print. 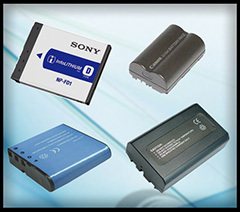 Smaller prints, such as 8×10 or 11×14 (or smaller), will fit into things like photo mailers. These are reinforced envelopes that resist bending and folding. They’re inexpensive (on the order of $1/envelope) and you can find them at most office supply stores or other stores online. The downside to these envelopes is that they can be damaged rather easy depending on their construction. I had a few prints go out only to arrive all chewed up and bent because of poor handling at the post office. The lesson here: use a photo mailer that’s large enough to house the print sandwiched between two pieces of cardboard. The extra material will help protect the print. For small prints, you can also use things like shipping tubes or boxes, but it’s often not necessary if you take the extra steps to protect the print. Any print over 11×14 will be more prone to damage if packaged in a photo mailer or envelope. In this case, shipping tubes provide a good means of protection at a fairly low cost. Yup, prints can be rolled up without damage — they’ll just have to be flattened upon arrival. If shipping via tube, I’d suggest getting a 3-inch diameter tube with the thickest wall you can find. Tubes will get crushed pretty easily, and it doesn’t take much to damage a print that’s rolled up inside. I actually had a tube (and print) get damaged in the mail recently. So my professional printer, Oscar Medina, suggested a packaging technique to me: roll the print between 1/2-inch to 1-inch smaller in diameter than the tube, then use packing paper to “float” the print in the center of the tube. This method allows for the tube to encounter some amount of damage without harming the print inside. And if you really want to be careful, double-tube the print with something like a 2-inch tube floating inside of a 3-inch tube. Whether the print is only mounted or completely framed, you now have a rigid piece to work with. Smaller prints can be packaged inside cardboard boxes with lots of packing material to keep it away from the edges. But larger prints will require heavier box material, foam liners, and other safeguards. 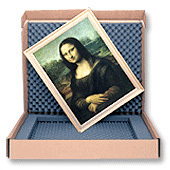 Just doing a quick search, I found a company that produces boxes and sleeves for fine art shipping: Airfloat Systems. I haven’t tried their products, but it looks promising. I actually haven’t packaged and shipped any framed work, so I’m going to have to lean on you guys for this part of the discussion. Anybody out there have some tips for what to use and what not to use? At any rate, I know that larger framed prints can cost several hundreds of dollars to package and ship — so be aware of this extra expense if you plan on doing this. Once you have your print all packaged-up and safe, it’s time to get it in the mail! I won’t get into the differences between the USPS, FedEx, UPS, etc — they all ship stuff. I find that the USPS tends to be the inexpensive option, even for international shipping. But I also find that they’re pretty rough with the merchandise. So no matter what shipping service you decide to use, there are a few things you should be doing with your prints. First of all, insure them! The cost isn’t usually outrageous, and it’s an easy way to help recover the cost of a damaged print. Sure, the claims process is painful and your print will never be damaged if you pay for the insurance (half joking here, but it always seems to be the case). But it’s good for peace of mind. Insure the package for at least the cost of the materials — that way the damaged print won’t be coming out of your pocket. Another thing to do is cover the package in stickers and stamps that say things like “Fragile”, “Photo Inside”, “Do Not Bend”, etc. This isn’t a safeguard, but it might help catch the attention of a careless mail handler and make them think twice about what they’re doing. Do you guys have any further tips and suggestions for packaging and/or shipping prints? Like I said, there are a lot of little tricks to this stuff and I’m sure I don’t know all of them. What have you had success with? And what has failed? Any horror stories on this topic? This entry was posted in Features, General Tips and tagged advice, art, fine art, packaging, photography, print, shipping, tutorial on July 16, 2009 by Brian Auer. Lots of great photography links from the last few weeks! Symmetry is a great way to make your compositions stand out. Here are some good examples that utilize this method. The beach is a typical vacation destination. So here are some good tips for photographing your next beach outing. Spontaneous moments are often the most exciting and most difficult to photograph. Here are a few tips to help you photograph the unexpected. Are you a DIY’er? Here’s a great list of projects that require minimal investment with a huge return! Long live Kodachrome!!! … or maybe not. Regardless, here’s a good list of links and resources associated with this soon-to-be-extinct film. Reflections are another great way to spice-up your compositions. Here are a few inspirational examples! My pal Richard put together a list of amazing nature photographers. These top 10 are definitely worth checking out if you haven’t already. Want to learn about digital photography? Check out this small list of essential photography blogs. I’ve been a subscriber to each of these 7 for quite some time. Pinholes are awesome because you can make them from inexpensive materials… and they work! Here’s a neat example of a Polaroid pinhole! This is so cool… links to some video and audio that shows how Kodak film was, and is, made. They were doing some pretty amazing stuff back in 1958! A discussion with Neil Creek about his adventure into professional photography. Great stuff for the aspiring photographers out there! Yup, lots of buzz on the new iPhone camera. Jim does a good job at reviewing the camera’s functionality. A cool set of photos to check out! It’s funny how the viewer perspective can be so heavily influenced by the photographer. Our pal Zoriah spends some time on the streets of Paris with Afghan refugees. As always, a breathtaking set of photos and stories. Chase Jarvis shares a great presentation from an event at the Art Director’s Club of Denver. He speaks on the topic of creativity and being the great artist that he is, Chase has a lot of good things to say. Chase Jarvis CURRENT: The Consequences of Creativity from Chase Jarvis on Vimeo. This entry was posted in Roundup and tagged links, list, News, photography, Roundup, tips, video on July 13, 2009 by Brian Auer. In previous polls we’ve discussed topics such as your favorite focal length, camera modes, autofocus modes, exposure modes, and types of cameras. So this time around, we’ll dive into the f-number. The f-number directly affects the depth of field in your shot. It’s also one of the three exposure controls, in conjunction with shutter speed and ISO. Based on our previous polls, I see that most of us are using a dSLR in aperture priority mode, so I’d expect that most of us have a “favorite” number or range of numbers. Personally, I favor F/2.0 on a ~50mm lens on a full frame camera. The DOF isn’t as crazy-shallow as F/1.4, but it still gives a nice amount of separation between background and subject at the distances I’m used to shooting at. Now, I realize that your choice of f-number will vary depending on focal length, sensor/film format, subject distance, and subject matter. But try to answer the poll with the number that you usually gravitate toward. And feel free to elaborate in the comments! And be sure to check out the last poll on the topic of “Why Are We So Compelled?” Lots of good thoughtful discussion there with 27 comments (and a few of them are quite lengthy)! As always, I appreciate the participation in these polls and discussions. This entry was posted in Reader Poll and tagged aperture, f-number, photography, poll, question on July 9, 2009 by Brian Auer.